I'm married to a police officer — someone who runs toward danger when everyone else is running away from it, someone who will miss seeing his baby's first steps because he's busy protecting another child from an an abusive parent, and someone who regularly sees gruesome scenes, including death, yet comes home to smile and laugh with his toddler. There are many reasons I'm beyond proud to be a part of this group of spouses, but there are just as many reasons it's not easy being a police officer's wife. [post_ads]When you kiss your spouse goodbye before they leave for work, do you ever have a real fear it could be the last time? I can't think this way, because if I do, it would consume me. But, I'm also human, so the thought does creep in every once in a while. And I know it's not easy for him either. Deciding to be a police officer takes bravery, and it's hard to be the one people blame for things when really all you're trying to do is protect them and their community. I see things differently being on this side. I don't curse cops for pulling me over, even if I'm not going that much over the speed limit. I thank them for helping prevent a bad situation. I can't watch the news when there are anti-police rallies with people shouting "Kill the cops!," because it's infuriating seeing the disrespect this occupation receives. I know there are bad cops, just like there are bad people in every occupation, but the majority of officers are good, kind people, and they need to be recognized as such. They protect people, catch thieves, take drunk drivers off the road, and help people find their way. They watch things when the rest of the world is sleeping, making sure all is well. They do things other people can't. They're heroes. The 24-hour scheduling, the risks of the job, and the stigma placed on police officers are all things that make it hard to be their spouse. While I'm playing Santa and setting out presents under the tree late on Christmas Eve, their dad is patrolling neighborhoods making sure burglars aren't getting away with another family's Christmas loot. While I'm up all hours of the night with a newborn baby, my husband is proctoring a sobriety test to someone who was swerving all over the road and could have caused a catastrophe. While I'm getting our daughter ready for school, my husband is facilitating a school crossing to ensure student safety. So, the next time a officer pulls you over for speeding or not wearing your seat belt, thank them for the reminder to stay safe. The next time you're stuck in traffic due to police investigating a car accident, take a breath and be grateful there will be someone there if you ever find yourself in a crash. And remember that these officers have families at home, families they would rather be spending time with than knocking on someone's door to tell them to turn down their music. 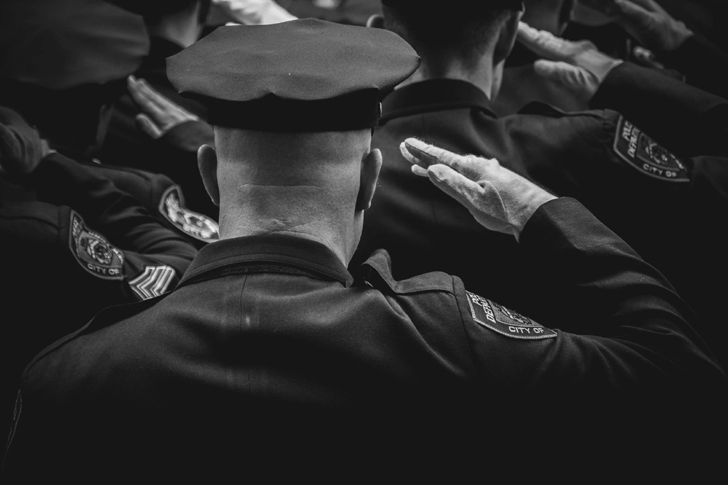 Every officer belongs to someone, so thank them for their heroic work in simply choosing this profession, and send a prayer they all make it home safely.